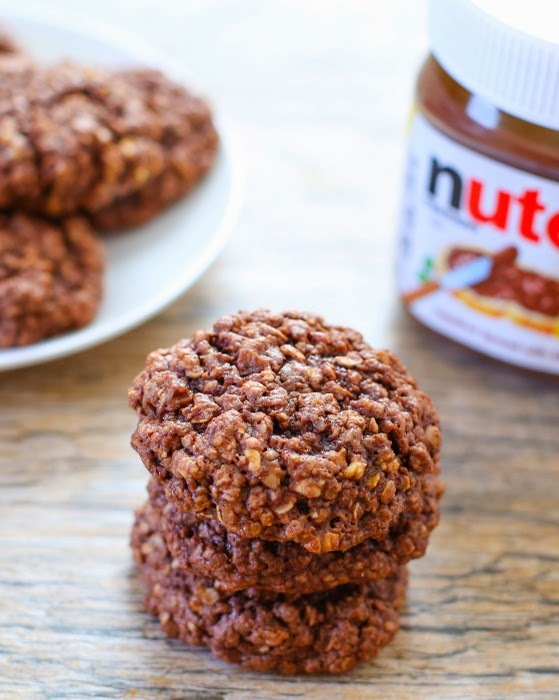 These flourless Nutella cookies are just four ingredients and so simple to make. 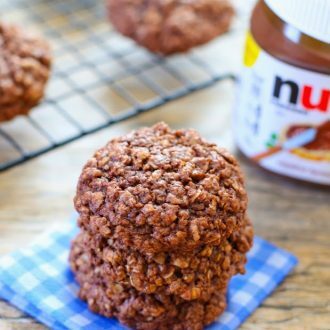 They are chewy, nutella-y, and have some healthy oats mixed in. I’m on another Nutella baking kick. I don’t know why, but Nutella has been on my mind a lot lately, so this weekend I experimented with making a flourless Nutella cookie. I’ve attempted to make a flourless Nutella cookie in the past, but without much success because they simply spread too much. But this time, I managed to make these delicious morsels with the help of quick oats, which holds the cookies together. 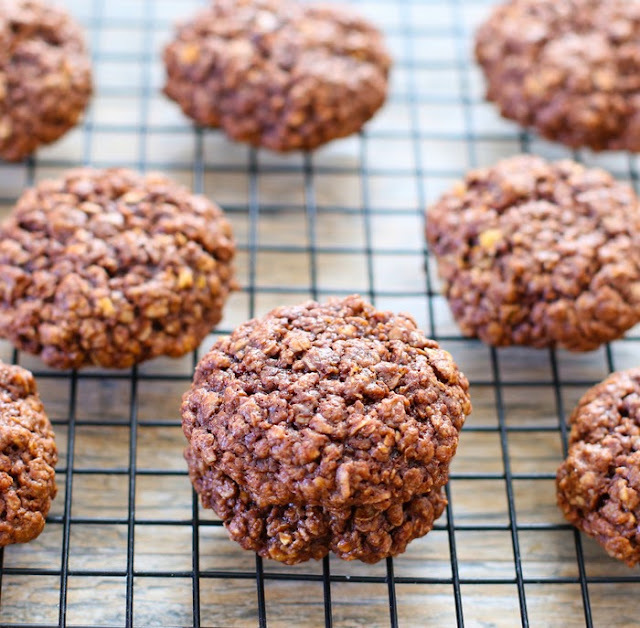 These cookies are chewy and tasty. You can add chocolate chips too, but I thought I’d made these ones plain. 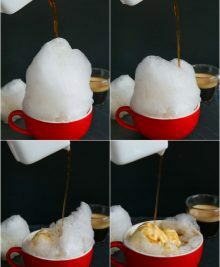 And best of all, they are so easy to make. You add four ingredients, stir, and the dough is ready. Less than five minutes of prep work! 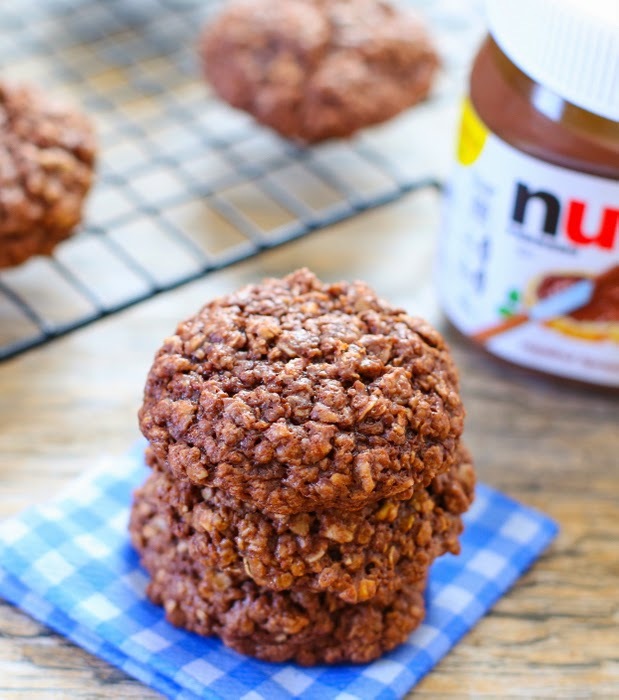 These flourless Nutella cookies are chewy, nutella-y, with healthy oats mixed in. Preheat oven to 350°F. Line a large cookie sheet with parchment paper or Silpat mat. Add all ingredients into a large bowl and stir with a large wooden spoon until everything is thoroughly mixed. Make small round balls, about 1 1/2 inch in diameter (you should have enough to form 10 cookies). Place dough balls on baking sheet, about 2 inches apart. Bake for about 10 minutes. Cookies will still be soft, but they will firm up once they cool. Let cookies cool on the cookie sheet until they are set and firm. yes, you leave them uncooked. Thanks for the great recipe, my kids love it !!! Could I use old fashioned oats instead? no, you need quick oats because they cook really fast. hmm that is strange. You may want to check your oven to make sure it isn’t running too hot. 350 f = 175 c.
I made the cookies with my niece (age 12) she loved them.